The SJC’s recent decision in Ajemian v. Yahoo, overturning the grant of summary judgment against Pierce & Mandell’s clients, continues to reverberate in the legal community. 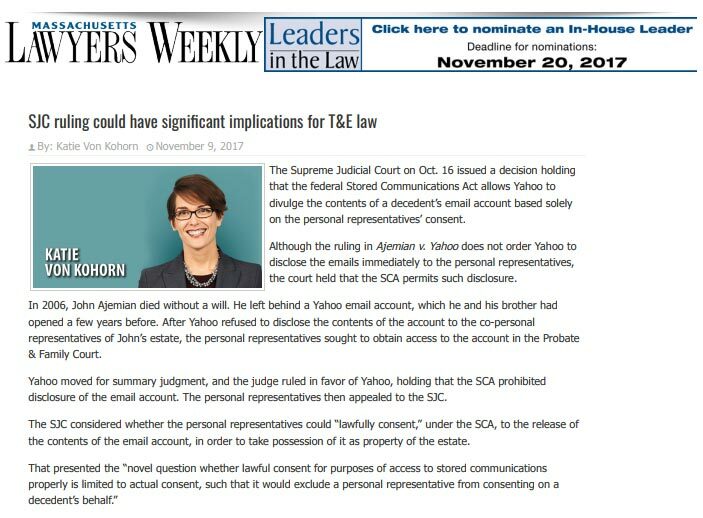 A link to the Lawyer’s Weekly article entitled “SJC Ruling Could Have Significant Implications for T&E Law” can be found here. The Massachusetts Appeals Court recently affirmed a decision by Judge Virginia Ward, of the Suffolk County Probate Court, granting summary judgment to Pierce & Mandell’s client in a lawsuit seeking a declaration regarding the interpretation of a will. Michael C. Fee argued the case before the three-justice panel, and Scott M. Zanolli and Curtis B. Dooling assisted in drafting the brief. The will at issue was prepared on behalf of the testatrix by her long-time companion at a time when she was suffering from terminal illness. The will made specific bequests of personal and real property, but omitted her interest as tenant in common with her brother in the family home. After her death, and her brother’s subsequent death, disputes arose regarding ownership of the real estate, and Pierce & Mandell’s probate litigators took the case to court in Boston. Our case law has also eschewed the broader meaning [of monies] . . .. In our view, the rule of thumb in these circumstances is that “money” should be construed as commonly understood, unless “a reading of the whole will produces a conviction that the testator must necessarily have intended” the broader meaning. Metcalf v. First Parish in Framingham, 128 Mass. 370, 374 (1880). Nothing in the language or context of [the testatrix’s] will supports the broader interpretation. One might equally expect English professors and writers to be precise in their choice of words, and not to have written “monies” if they meant “anything else.” See Strunk & White, The Elements of Style 21 (4th ed. 2000) (“If those who have studied the art of writing are in accord on any one point, it is on this: the surest way to arouse and hold the reader's attention is by being specific, definite, and concrete”). Finally, the Court acknowledged that in interpreting wills under Massachusetts law there is generally a presumption against intestacy, and that “’a construction of a will resulting in intestacy is not to be adopted unless plainly required; and it is to be presumed that when a will is made the testator intended a disposition of all [her] property and did not intend to leave an intestate estate.’ Lyman v. Sohier, 266 Mass. 4, 8 (1929).” However, in this instance, nothing in the will’s language and the circumstances surrounding the execution of the will, demonstrated the testatrix’s intent with respect to her interest in the real estate. Pierce & Mandell attorneys Michael C. Fee and Scott M. Zanolli regularly litigate in Probate Court in Boston, and throughout Massachusetts. Together they handle a variety of probate litigation and trust litigation cases including petitions for formal appointment of a personal representative, petitions for probate of wills, will contests, undue influence cases, contested accountings by personal representatives, trust petitions for allowance of accounts, contested trust accountings, and petitions for removal of trustees. A full copy of the opinion can be found at Roth v. Newpol, 91 Mass. App. Ct. 609 (2017).